The Cart Shed is a light and airy spacious barn conversion with high beamed ceilings and stone floors. 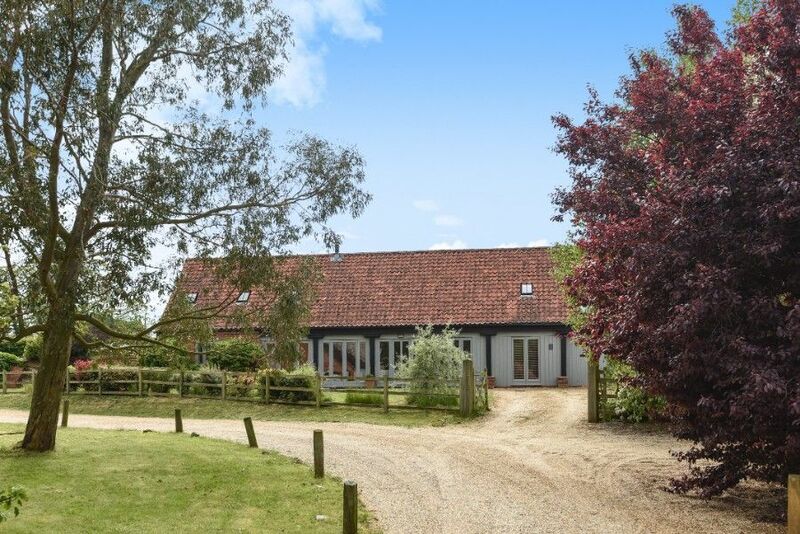 It is in a lovely rural location only minutes drive from the beautiful Norfolk coast and the charming Georgian village of Burnham Market. Downstairs there's a wonderful large open plan living area which is perfect for family and friends get togethers, there is also the advantage of a ground floor bedroom and bathroom. Upstairs there are 2 further comfortable bedrooms, with a stunning oak beamed master bedroom with lovely countryside views. Ideally situated with a south facing garden overlooking a meadow and only a short walk to the fantastic Creake Abbey farmshop and cafe, as well as a good local pub. Spacious open plan kitchen, dining and living area with stone floors and high beamed ceilings. Kitchen: Lovely farmhouse style kitchen with built-in Neff electric oven and separate hob, dishwasher, microwave, fridge. freezer. There's a dining table seating 8 and a door to the south facing garden. Sitting room: Large room with a wood burning stove, sofas, flat screen TV and DVD player. Bedroom 3: Spacious room with twin beds, bedside tables and lamps, dressing table. Bathroom: bath with shower mixer taps, hand basin and WC. There's a long galleried landing along which the 2 bedrooms lead off. Bedroom 1: Attractive room with high pitched beamed ceiling and lovely meadow views. King-size bed, bedside tables and lamps, chest of drawers, wardrobe. Bathroom:Walk-in shower, hand basin and WC. Bedroom 2: Large room with high pitched beamed ceiling with a double bed and a single bed ( and space for a 4th child to sleep if necessary). Accessed via a driveway off Norman's Lane where there is a select development of 6 barns. There is parking space for 2 cars outside the Cart Shed. An enclosed south facing garden which is mainly lawned and backs onto a meadow. There is outside furniture and a barbecue. Dog owners: Please note that the garden is not completely dog-proofed. Out-house: with washing machine and tumble dryer. There is also a fold-away table tennis table which may be used.